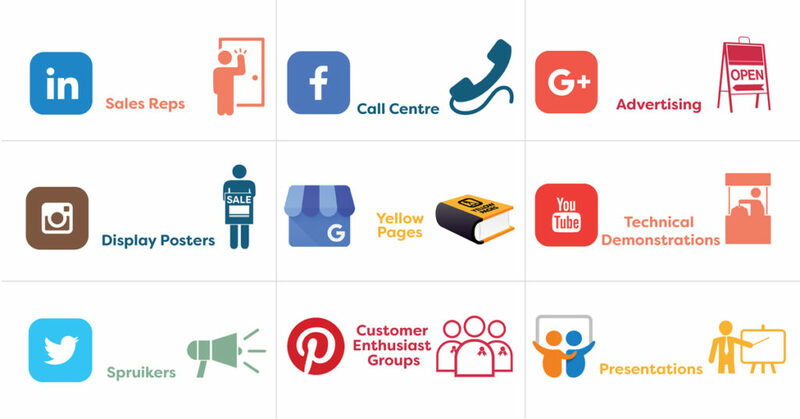 Which platforms are the best for B2B social media marketing? Why social media? I hear you ask. It’s simply a question of where your customers are, versus where they are not. It isn’t many years ago that we’d find the things we needed by locating a supplier in the Yellow Pages. Other than that, we’d see them on one of the few TV channels, or spot their brand in a magazine, at a trade show, or on a billboard. Most of the options just mentioned are either dead, or rapidly headed in that direction. The benefits of social media for B2B marketing relate to joining the conversation online and letting the world know about your expertise. It’s like your ‘digital billboard’, where you create brand awareness, and develop authority. Unlike traditional billboards, social media allows you to build a ‘connected audience’, it does not need to cost thousands of dollars per month, and it has the advantage of being everywhere. The Incite Group recently published ‘The State of Corporate Social Media’ report for 2017, in which they identified that a massive 84.9% of the working age population is now present on LinkedIn. This makes it THE business to business marketing platform. Facebook has an even higher percentage of the adult population using it, and in fact 7 out of 10 Australians (of all age groups) use Facebook every month (statistics compiled by SocialMediaNews.com.au for July 2017). Those are some pretty impressive stats. But businesses still need to make the choice. Which of these tools represent tangible value to your business, and also an appropriate use of your team’s time? Below; we’ve laid out our opinions regarding a few of the common social media platforms. These are the ones that ‘make the list’ for B2B social media marketing in our opinion. In a hurry? Click Here to download our ‘At a glance guide to business-to-business social media marketing platforms’. As already outlined by the statistic above; this is the go-to platform for business-to-business marketing. Most professionals use LinkedIn to connect with other business people, check out companies they are considering doing business with, and getting exposed to industry-related news. If you are selling to other businesses, then you will be expected to be on LinkedIn. From an advertising perspective, you can target your audience by industry and by role very easily on LinkedIn. You are likely to pay between $4 and $12 per click to get your message out there, which is reasonable when compared with most segmented industry-media. Note that to access a very senior audience, LinkedIn will probably be charging you over $10 per click. If business people are known to be on LinkedIn, then everybody is on Facebook. Facebook is the social media powerhouse that eclipses all others. Simply being on Facebook and posting regularly is actually great for your SEO too. We’ve seen new websites which could not be found on Google at all, begin ranking within a few days of commencing Facebook activity. Video content works very well on Facebook. MP4 videos will autoplay when they are on screen, which often generates the most shares. If you intend to boost your posts to reach new audiences, there’s good news: Facebook cost per click tends to fall into the $1.50 to $5 range depending what you are trying to achieve. One thing worth highlighting in B2B context, is that Facebook is really, well, social. People will comment on your page and your posts, they may not always say nice things, they could swear. There are ways to hide comments and block users but bear in mind that LinkedIn has a much more controlled/formal feel from that perspective. The reason you want your business to be on Google+, is that it is owned by Google. Google decides which websites will turn up in search results, and Google values social media activity on its platform. We suggest you just grab your posts from LinkedIn and Facebook, and post them to G+ as well. It will take your team an extra minute. Not strictly a social media platform, but very important if you want your customers to be able to find you online. Google My Business (GMB) is the centralised place for you to manage your business listings, opening hours, photos, events, and the addresses that you would like to appear in search results. Recently Google has added the ability to post content directly into GMB, so we anticipate this tool will become more social over time. Importantly, engaging, visual and accurate content in Google My Business will improve your local SEO. News updates last for about a week, and events will be shown until they are complete. YouTube is an incredibly popular resource for people to be presented with entertaining and instructional video content. As a business, you should think of it as somewhere to put your video content for free, that also ranks well on search engines. YouTube is great for storing product demonstrations, how-to videos and more. If you embed the videos into your webpages, it is likely to improve the search ranking of those pages, and also your overall website traffic. Because of its popularity as a source of entertainment, YouTube is also great for transmitting visual ads towards potential audiences. Display ads are often very cost-effective, with costs per click as low as $0.10, and usually under $5. Use Twitter if what you are saying is brief, and happens to be newsworthy right now. Attendance at a trade show, awards ceremony or other industry gathering is a great time to leverage Twitter. By doing this you associate your brand with the flow of content coming out of that popular event; and this may be the only time your audience is active rather than just consumers of Twitter content. You can support your success on Twitter with boosted tweets or advertising that targets the event itself. Twitter can also be useful for sharing branded content such as podcasts and blog posts; and these tweets can also be boosted with a few advertising dollars. If you can say it visually; Instagram-it. Instagram attracts a very high proportion of 18-35-year-old users, and is excellent for sharing great photographs and short video of what you do. Just in the last 6 months there has been a significant increase in the Instagram accounts created for 35-45-year olds as well, and it is growing rapidly. Advertising on Instagram is closely linked with Facebook; so you can set up one campaign in Facebook, and deploy the ads through both platforms automatically. Pinterest is another highly-visual platform. It is known as the place to go for great images, photos, and infographics. Many people use Pinterest as the place to look for inspiration, in the same way they use YouTube to look for instruction. If your business produces a particularly good-looking or innovative version of that thing you do, then Pinterest might be for you. Pinterest is significantly more popular amongst women. It looks to be here to stay, but has been losing market share over the last 12 months. If YouTube is for video, and Pinterest is for pictures, then SlideShare is somewhere in between. Infographics and slides work well on SlideShare. How-to guides and white papers can also be posted to good effect (as long as they are self-explanatory). Owned by LinkedIn, SlideShare achieves good search engine rankings, meaning your slides can be found by your potential audience. SlideShare is where you demonstrate that you, are the authority on your subject. In summary: Think about how the channels fit with the kind of people you want to talk to, and the customer journey you hope to take them on. Concentrate on the two or three platforms which will contribute the most (including being able to find you, i.e. SEO). For most B2B businesses, these are likely to be LinkedIn, Facebook and Google+. For an overview of Arrow’s social media marketing services, or how we can deliver a successful advertising campaign please give us a call. Click Here to download our ‘At a glance guide to business-to-business social media marketing platforms’.